Ireland’s Thomas Barr qualifies for the final in Berlin on Tuesday night. Photo: Inpho. 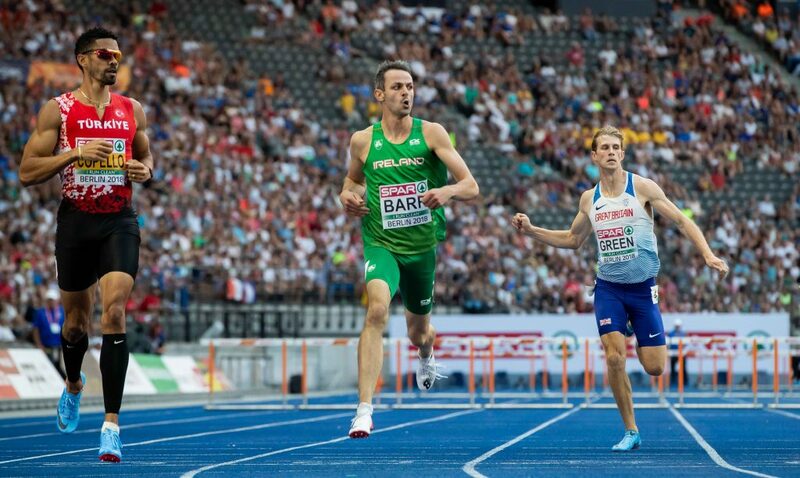 Waterford’s Thomas Barr (26) bids to join a small group of Irish people to medal at a European Championships tonight when he goes in the 400m hurdles final in Berlin at 7.15pm Irish time. After finishing second in his semi-final, in a time of 49.10, he has been drawn in the less than ideal lane eight for tonight’s final but that’s not bothering him. “It will be difficult,” he says, “not having anyone to gauge but it will force me to put on the blinkers and just go for it. And go really hard, the first 200m in particular. To me, I can take positives and negatives from each lane. In lane one, you have a view of the whole field. In lane eight, it’s not as sharp a turn, so you can actually attack the hurdles a lot more. Winning a medal from the outside lane isn’t unheard of. Far from it. American Kori Carter won the gold medal in the women’s 400m hurdles at last summer’s World Championships in London from the outside lane. The dangers will be Karsten Warlhom from Norway and Yasmani Copello from Turkey (who finished ahead of Thomas in their semi-final), plus Rasmus Magi from Estonia, who won silver four years ago, and the fast improving 22-year-old Patryk Dobek from Poland. If Thomas should trump his fourth placed finish at the Rio Olympics and finish in the medals he will join fellow Irish athletes, Delany, Murphy, Coghlan, O’Sullivan, Carroll, O’Rourke, Heffernan, English and Mageean to medal at the Europeans. Best of luck Thomas….all of Waterford, and Ireland are behind you.